Truth by Kbaig: INDIA-PAKISTAN FRIENDSHIP? In spite of being innocent Dr. Khalil Chishti returned back to Pakistan after passing his youth in Indian jails. His family was much emotional on his return, of course Pakistani nation was also much happy on the release of their citizen from Indian prison. However our pro-Indian media presented release of Dr. Chishti as a friendly gesture of India for Pakistan, and in the way the live coverage and programs that were telecasted by media are beyond rationalism. Moreover the release of Dr. Chishti is very unique happening of the history of diplomacy that an innocent citizen who has been released and returned to his own country but practically he is still in the custody of India. His passport has been handed over to Indian embassy in Islamabad, but our shameless representatives of honor-less media has not dared to discuss this that how a citizen in spite of being in his own country could be prisoner of alien country? This is also clear that Dr. Chishti was not involved in any criminal activity in India. He was arrested on the basis of doubt just for being Pakistan and this is his greatest crime that he was Pakistani, So Indian state terrorist agencies kept him in prison for twenty years, showing the friendliness of Hindu. On such tragedy legally and morally we; Pakistanis should have protested against India on every platform for keeping our innocent in prison illegally without any legal reason or logic. World should have been informed about the treatment of Indian Police and terrorist agemcy RAW with those Pakistanis who go to India either to see their relatives or for business, the number of those who denied to be an agent of RAW for terrorism in Pakistan and were put in prisons, tortured to death or mad and many of those who are still bearing Indian hospitality in Indian jails just for being Pakistanis. But out electronic media in order to pay back the dollars they receive for their costly life style presented all this situation as a FAVOR over Pakistan. Our pro-Indian anchors, intellectuals, industrialists suffering from mental slavery of India either could not understand or they accompanied India in presenting that only Pakistan is root of all disputes in subcontinent, because the dance of all these so-called Pakistani elements over release of Dr. Chishti on payroll hid all the conspiracies of India against our integrity and problems created by India for Pakistan. While India is ready to go to any extent for friendship with Pakistan (even torturing innocent Pakistanis who deny to sell their belief and subconscious to Indian terrorist agencies). Let’s return back to our previous topic, the plan of destruction of 10 aero planes of British Airways through LIQUID EXPLOSIVES. After failure of this plan the Samjhota Express was destroyed with this type of explosive. After reading this one may imagine that what type criminal silence is being observed on Pakistani side by a special group of our journalists, intellectuals, media and our RULERS. 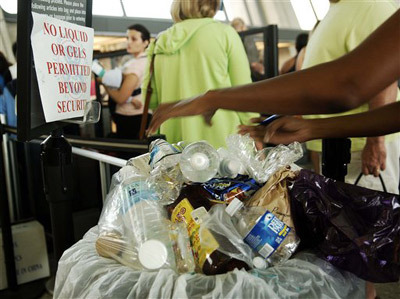 In august 2006 when over the report/warning of ISI a plan to destroy ten airplanes of British Aireways bound to Canada/USA through a chemical looking like water was discovered, the security over British and European airports was so much tightened that not only water bottles but baby feeding bottles were being captured by Airport Security forces and this is still going on. British police and Secret agency MI-5 arrested 25 suspects out of which no one was a Pakistani. However parents of two them belonged to Pakistan and three of them were English who had converted to Islam after watching the tortures to Muslims in the world. At that time this was disclosed as well that Pakistani govt. has informed British govt. about this type of terrorism in May 2006. After four months of investigations British police arrested suspects and informed the world about the details of the plan. Where the Terror Began discloses that like abduction of tourists, attack over British parliament the destruction of British Airways was also planned by Indian Agency RAW. After investigation it was revealed that this liquid chemical/explosive is actually a type of Liquid Oxygen Peroxide. It has two types TATP-1 and HMTD (Hexamethylene triperoxide diamine). The second type is so much sensitive that even a very little shock or friction. The other feature of this liquid is that it can burn anything to ashes in no time. The most important fact is that India is the only country where including liquid explosives many such dangerous chemicals are being produced. 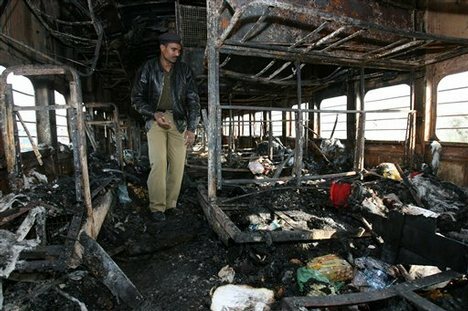 Still the investigations over the terrorist plan in Britain was going on that after six months on 18 February 2007 Samjhota Express suddenly caught fire as soon as it passed from the Panipat railway station. After few minutes Indian media started propaganda attack over Pakistan and Pakistani agencies, all Indian TV Channels and anchors had only one thing to say that Pakistan is involved in burning of Samjhauta Express. 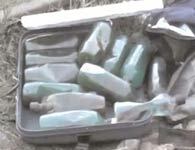 At the mid night Police Commissioner presented a bottle filled with water like substance and told media that this is the chemical used to set fire on the Samjhota Express, in this press conference the plan of terrorism in British Airways was especially mentioned that terrorists planed airplanes through same type of explosive (however they forgot that this type of liquid explosive is only manufactured in India).